Aerial parts of annual herbacecus plant Schizonepeta tenuifolia Briq. of family labiatae. Mainly cultivated in Jiangsu, Zhejiang and Henan provinces of China. Blossom to top with green spike in summer and autumn. Fragrant smell with slightly astringent, pungent and cool taste. Light yellowish green color with long and firm spike, strong and fragrant smell. Unprocessed or stir-baked to charcoal. Pungent, slightly warm; lung and liver meridians entered. Dispel wind and release exterior, promote eruption, alleviate itching, charcoaled version stops bleeding. 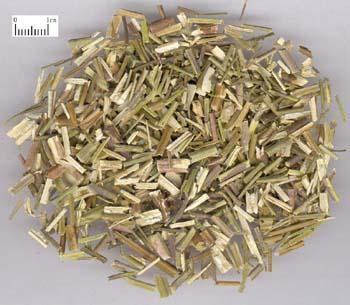 This herb is mIld and indicated for exterior syndromes and is widely used for wind-cold, wind-heat or syndromes where heat or cold are not obvious. It is indicated for wind-cold exterior syndrome, marked by aversion to cold, fever, headache without sweating. 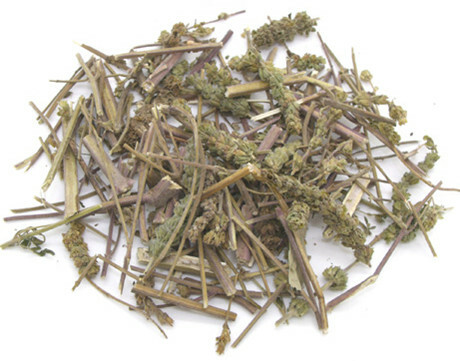 It is usually combined with herbs that disperse wind-cold. For instance, it is combined with Fang Feng and Qiang Huo in Jing Fang Bai Du San from She Sheng Zhong Miao Fang. It is indicated for wind-heat exterior syndrome manifesting as fever and headache. It is combined with herbs which disperse wind-heat. For instance, it is combined with Jin Yin Hua, Bo He and Lian Qiao in Yin Qiao San from Wen Bing Tiao Bian (Analysis of Warm Diseases). This herb has the action of dispelling wind and alleviating itching. It is indicated for wind pathogen binding the exterior, marked by itching of the skin and other symptoms. It is often used with Chan Tui and Fang Feng to dispel wind and alleviate itching. The charcoaled one of this herb has the action to stop bleeding. It can be used for hematemesis, epistaxis, hematochezia, metrorrhagia and metrostaxis, or other kinds of bleeding syndromes. When indicated for hematemesis or epistaxis due to frenetic movement of blood heat, it is usually combined with Sheng Di Huang and Bai Mao Gen to cool the blood and stop bleeding. When indicated for hematochezia due to blood heat and bleeding due to hemorrhoids, it is often combined with Di Yu and Huai Hua to cool the blood and stop bleeding. When indicated for metrorrhagia and metrostaxis, it is usually combined with Qian Cao and Guan Zhong to stop this type of bleeding. Decoct 5~10g. Do not cook too long. The unprocessed form is suitable for dispelling wind, releasing the exterior and stopping itching; the one charcoaled is suitable for stopping bleeding.